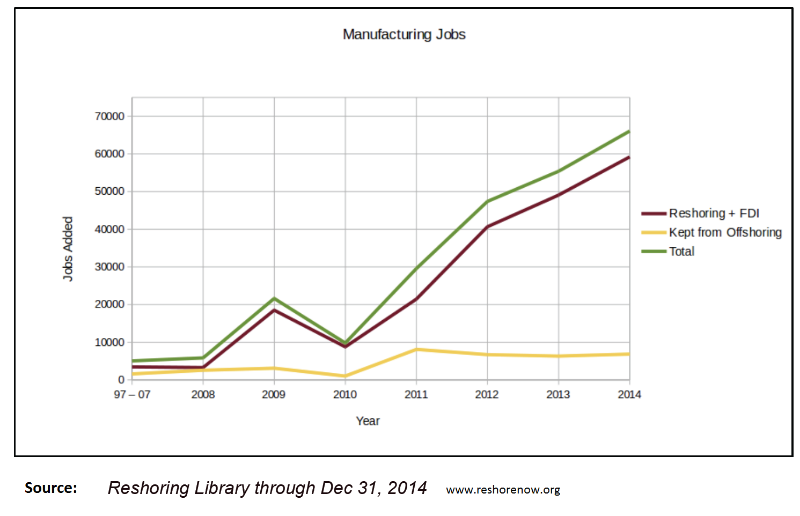 The numbers are in for 2014, and it proved to be quite the notable year for reshoring jobs in manufacturing. It seems that for the first time in two decades America brought more jobs home than were shipped overseas. 60,000 manufacturing jobs were added in the USA in 2014, either through reshoring, or FDI (foreign direct investment) in which foreign companies move production to the U.S. - according to a study from the Reshoring Initiative. It appears that as many as 50,000 jobs were offshored last year, leaving a healthy, positive net gain of 10,000 jobs here at home. This is a dramatic contrast to the 2003 numbers when only 12,000 jobs were reshored vs. 150,000 offshored leaving a negative 138,000 jobs in a single year. Patriotism and the pursuit of positive corporate image, due to public demand for "Made in the USA"
What areas are feeling the impact most? The largest reshoring projects tend to go into the southeast and Texas.The tendency is for green-field factories to go into these lower wage, lower tax, right-to-work states. The Midwest is second based on reshoring to its strong industrial base. Reshoirng in the north is more often into existing company facilities. Innovation, supported by strong teaching institutions and motivated local governments, can translate into good-paying manufacturing jobs. Technology such as cutting-edge ERP and CPQ software can also help manufacturers compete better at home and abroad.